Pep Guardiola registered another victory over Jose Mourinho in a one-sided Manchester derby that saw home side City go 12 points clear of their neighbours after just 12 games of the Premier League season. David Silva opened the scoring for the hosts in the opening quarter of an hour, keeping his composure to finish smartly after Bernardo Silva had done well to keep a Raheem Sterling cross alive. United worked hard to thwart a City onslaught for the rest of the first half, but fell further behind when Sergio Aguero thrashed a shot past David de Gea early in the second. Anthony Martial made it five straight Premier League games with a goal from the penalty spot after Ederson had brought down Romelu Lukaku less than a minute after the Belgian striker had entered the fray as a substitute – but that was United’s only shot on target and Ilkay Gundogan wrapped up the points for City when finishing a wonderful team move five minutes from time. Pep Guardiola set Manchester City up in a 4-1-4-1 formation, with Fernandinho in his customary position between the defensive and midfield lines. 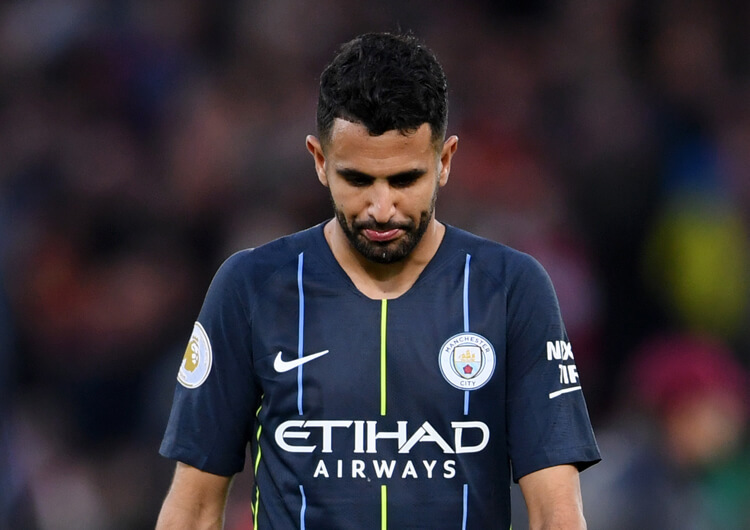 Riyad Mahrez, Bernardo Silva, David Silva and Raheem Sterling played in the attacking midfield roles behind Sergio Aguero in attack. City dominated the ball, with 64 per cent possession across the contest, and looked to play through and around the United block as much as possible. 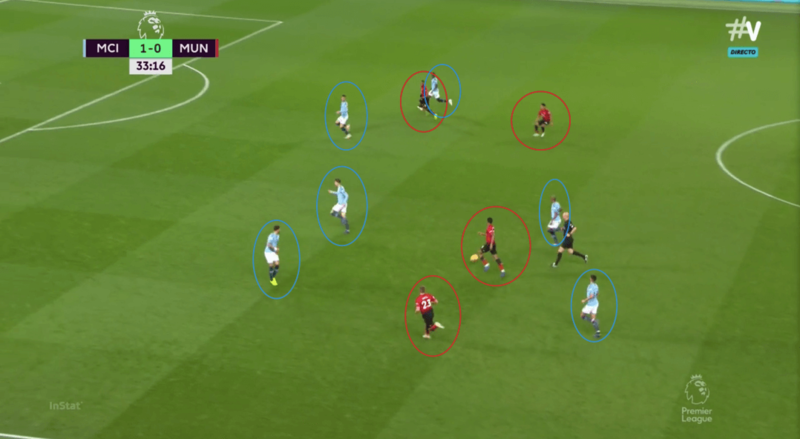 They did this through movement of the ball between their defenders and Fernandinho, while the attacking midfielders would drop in, rotate and utilise blindside movements as their direct opponents’ eyes were focused on the ball. 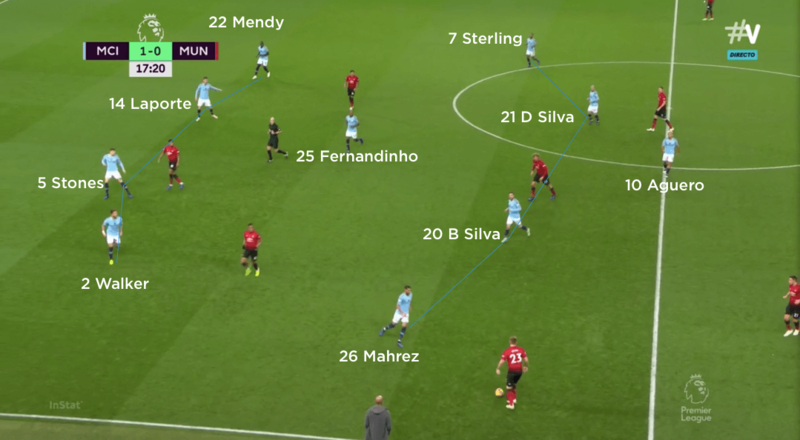 As United operated in a man-oriented structure out of possession, City were able to drag their opponents out of position to create spaces for their teammates to penetrate. David Silva and Bernardo Silva would often drop to the same line as Fernandinho in order to bring Nemanja Matic and Ander Herrera with them. 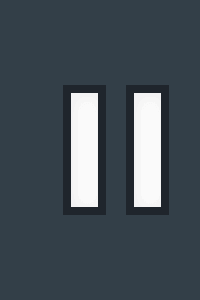 This would then create space behind for Aguero to drop in to, or for Sterling or Mahrez to move inside.  In turn, this would allow Benjamin Mendy or Kyle Walker to push up; as the ball then came in to David or Bernardo Silva, they could play it immediately outside to the full-back or bounce it back to a centre-back, who could then play through to Aguero, Sterling or Mahrez and eliminate the United midfield line. City could also regularly be seen switching play – particularly in the first half – with longer passes. As they progressed up the pitch, they would often have Aguero dropping in between the lines unmarked by the United centre-backs, who would be occupied by Sterling and Mahrez or the two Silvas. This would then allow Aguero to receive, turn and play forward, as was evident for City’s second goal. Out of possession, City switched between a high press and a 4-1-4-1 mid-block. After losing the ball, they would initiate an immediate counter-press where they would look to flood the man on the ball with bodies and apply high pressure. 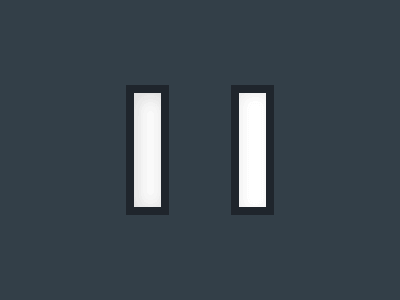 If the press was evaded, then they would have to recover quickly and form their block. 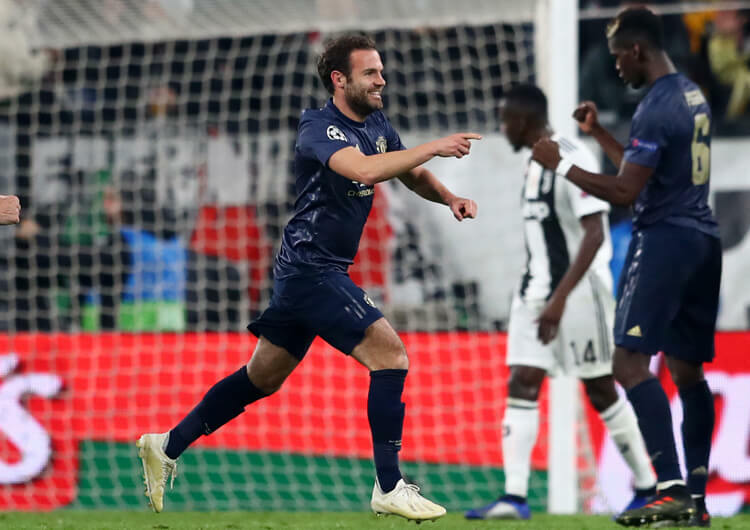 When in the block, they would try to keep United in the wide areas, where they would use three players – the full-back, the attacking inside midfielder and the wide attacking midfielder on that side – to shut down options. When pressing high, it would tend to be David Silva and Aguero on the top line. They would press the United centre-backs, supported by the wide attacker and inside midfielder on that side in a kind of diamond shape. The other inside midfielder would sit deeper with Fernandinho, providing some balance inside. 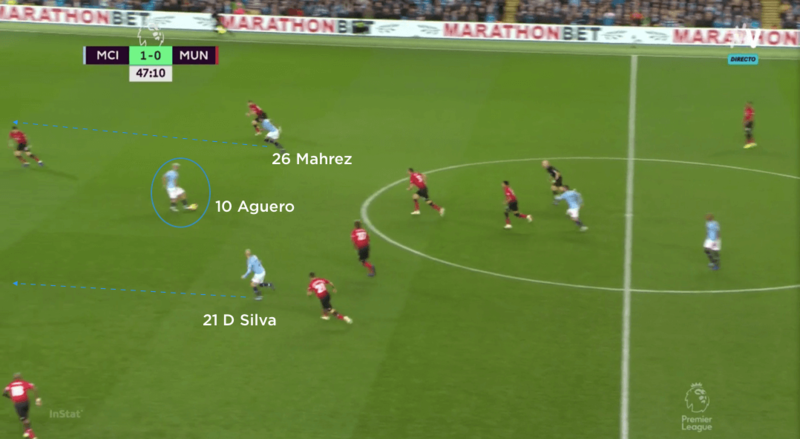 Even in a mid-block the City positioning was quite aggressive, with a short distance between Fernandinho, the attacking midfielders and Aguero. That left a larger distance between Fernandinho and his back four, but United never managed to get into that space and threaten the City defence. 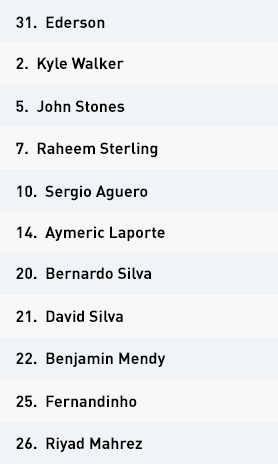 Manchester City set up in a 4-1-4-1 formation in possession, with Raheem Sterling, David Silva, Bernardo Silva and Riyad Mahrez supporting lone forward Sergio Aguero. City used a 4-1-4-1 mid-block out of possession. When pressing high, it would usually be David Silva who got closer to Aguero on the top line. 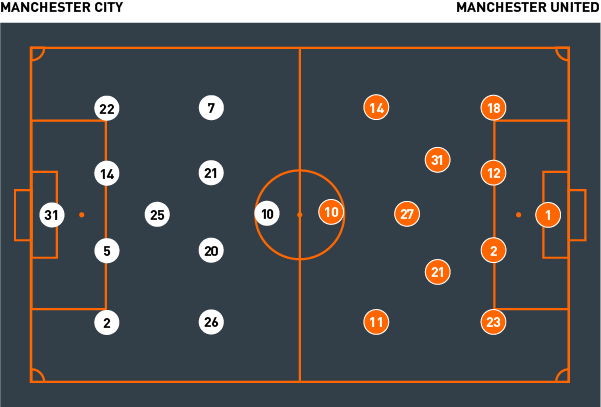 The hosts would use movement and rotation between their individuals to try to create spaces to play through United. Here, Raheem Sterling moves inside from the left to create room for David Silva to run in to and receive from left-back Benjamin Mendy. When they didn’t have the ball, City would try to show United into wide areas and then shut them down in groups of three. Here, it is Mendy, Sterling and David Silva combining in defence rather than attack. 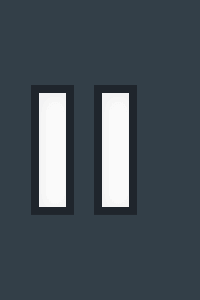 Aguero could often be seen dropping in between the lines to get on the ball. The United centre-backs wouldn’t follow him, which allowed him to turn and combine with runners from midfield – just as here, in the build-up to the second goal he eventually scored himself. Manchester United set up in a 4-3-3 in possession, with Anthony Martial and Jesse Lingard either side of lone striker Marcus Rashford. United used a 4-3-3/4-5-1 mid-block out of possession. They would allow City’s centre-backs to have the ball but then initiate a press when the hosts’ full-backs or midfielders were in possession. 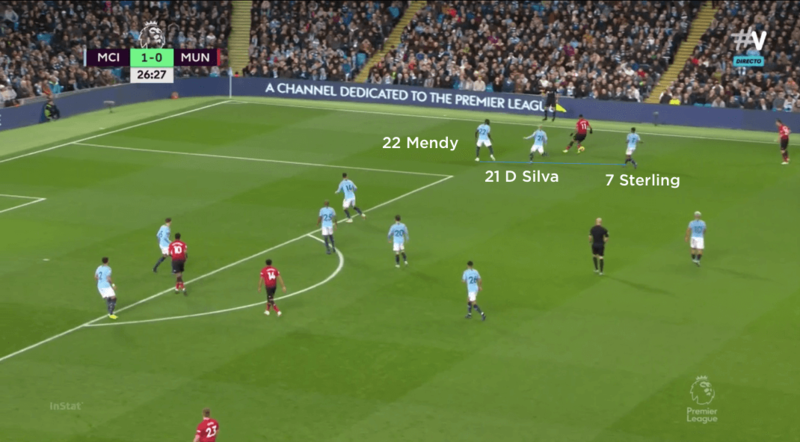 The visitors would often move with their direct City opponent, as seen here where Ashley Young tracks Raheem Sterling inside and Ander Herrera follows David Silva wide. This could pull United out of position and provide gaps for the hosts to play through, however. United would often attack down their left, with full-back Luke Shaw pushing up and Martial moving inside to join Rashford and Lingard. However, the numbers were still insufficient to create any chances of real quality against a fast-recovering City defence. Jose Mourinho set his United team up in a 4-3-3 formation, with Nemanja Matic, Ander Herrera and Marouane Fellaini in midfield, behind a front three of Anthony Martial, Jesse Lingard and the central Marcus Rashford. United struggled to gain control of the game in possession, but their game plan suggested that they were willing to give up the ball and look to hit City on the break with the pace of their front three. 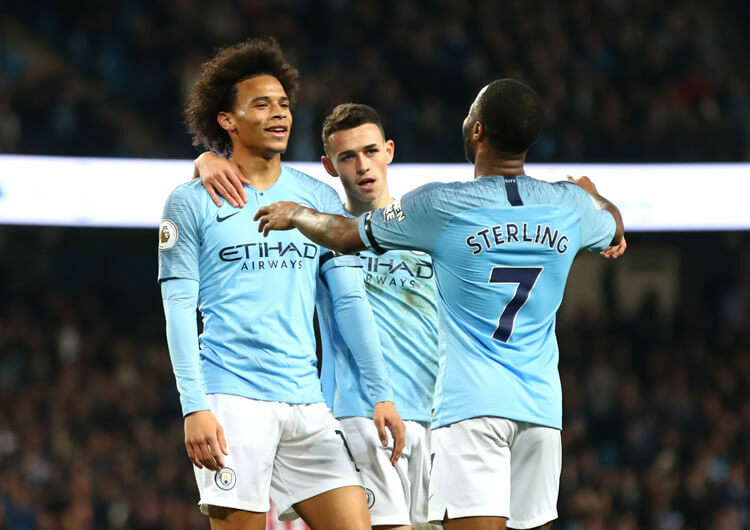 The issue with the counter-attacks was City’s ability to counter-press effectively, and recover with greater numbers than United were willing to push forward. 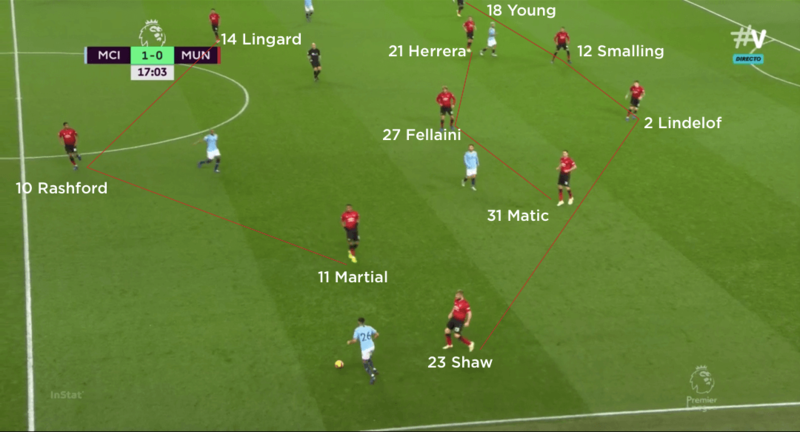 On the occasions when United did try to build attacks, they would often utilise the left-hand side, where Luke Shaw would push forward from left-back while Martial and Lingard moved inside – but these numbers were insufficient to attack with and United created very little as a result. The introductions of Juan Mata and Alexis Sanchez in the second half gave the visitors more players willing to drop in and get on the ball in order to create attacks. They could still maintain the width of the full-backs, the security provided by Matic and the forward threat of Martial and substitute Romelu Lukaku, but United still struggled to create anything of note and managed only one shot on target – the penalty from which Martial scored – throughout the game. 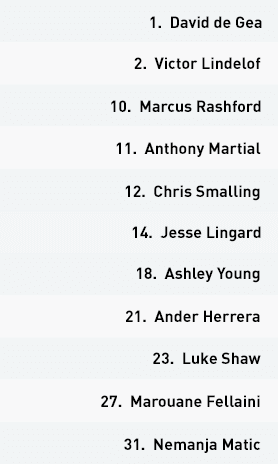 Out of possession, United set up in a 4-3-3/4-5-1 mid-block. They would allow City to have the ball in their own half and only look to engage when the ball went into a full-back or midfielder in United’s half. 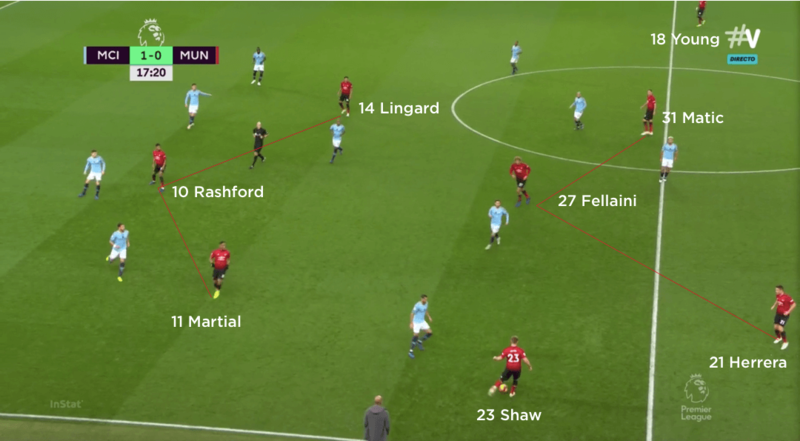 The front three of Rashford, Martial and Lingard would position themselves on the same line as Fernandinho when City were building up, which meant that none of United’s midfield would get attracted to him when he received the ball. Matic and Herrera were responsible for the two Silvas; they would track them whenever they dropped in, making it difficult for the City playmakers to turn and face forward. However, spaces would still open up behind them, which City could and did exploit to good effect. 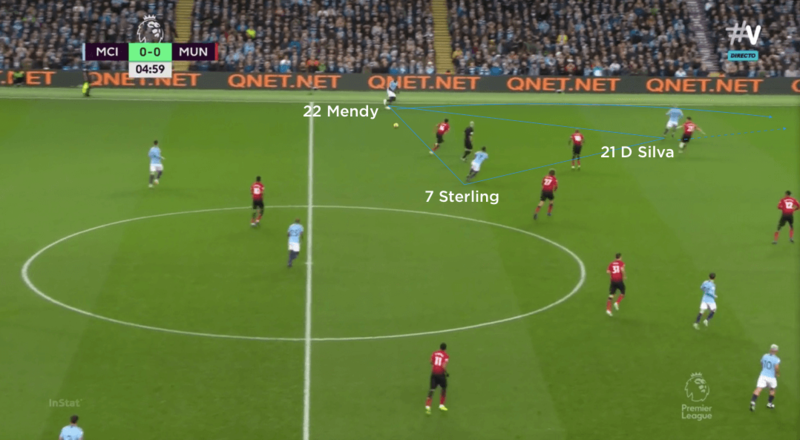 Full-backs Shaw and Ashley Young were responsible for Sterling and Mahrez, and would also drop and move with them – although this created the same problem with space in behind that the United midfield faced. 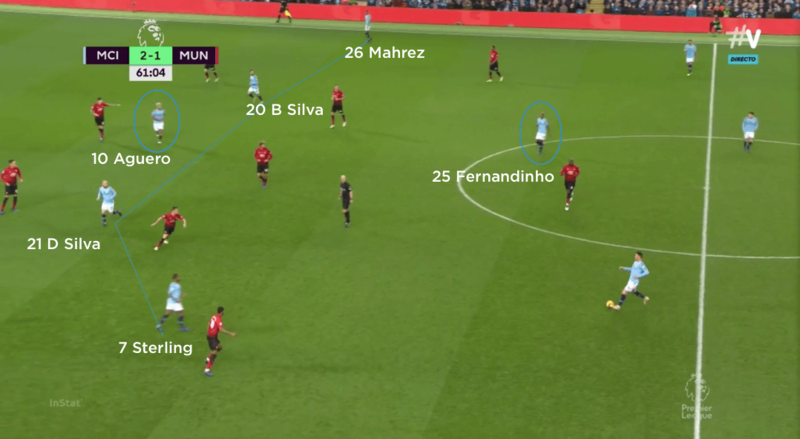 On the rare occasions that United pressed City higher, the three forwards would press the back four and Fellaini would jump on to Fernandinho. The Belgian would also go to shut down Fernandinho if the Brazilian had received the ball facing forwards. In truth, however, despite the visitors working hard they never got to grips with the hosts and were well beaten.